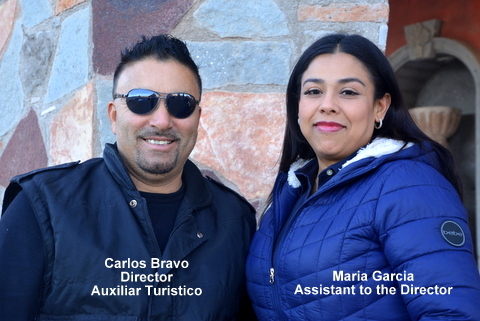 In Part I of our ongoing series about the economic impact on Puerto Peñasco by the new home port we covered the historical growth and contribution of the cruise industry as a whole to the world economy and provided basic statistics on cruise passenger travel and spending habits gonflable Arches. 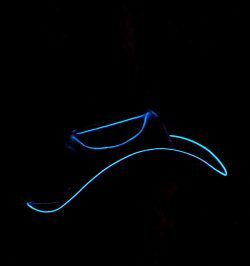 Our goal over the course of these series is to provide as thorough an understanding of this unique and lucrative market, known affectionately as “cruisers”, as possible. Each Part of our monthly series will either delve more deeply into impact areas introduced in the last installment, or introduce a new area of critical importance to maximizing the positive impact of the homeport on our economy gonflable Arches. We promised Part II would contain more information and detail about what Puerto Peñasco can project in tourist expenditures. Thus, we now delve more deeply into how cruisers spend money throughout their cruise vacation and we continue profiling the “vacation mentality” of a typical cruiser. Thanks to the diligent pursuit of learning everything about their customers, cruise lines have historically gathered great statistics on cruisers’ every habit and desire, including how they rate their experience at each stage of vacation from embarkation, while onboard, during ports-of-call until debarkation. This is because cruise line companies thrive on knowing their customers’ level of satisfaction regarding every detail of their cruise. Cruise lines have perfected the system for garnering honest and timely feedback from the majority of customers through carefully prepared questionnaires. They are quick and easy to complete and are collected by the cabin stewards. Faithful and thorough studies of this information identify what is going right and what needs improvement. Analysts also discover new trends from all the information collected. You may be wondering why we go into such detail about the cruise industry’s obsession with data collection. Well, becoming a homeport even as we stand at the threshold of status as a world-class destination, perhaps the most important fact we can learn is actually why the cruise lines do pay such close attention to their cruisers: they use the data to constantly enhance their services, upgrade amenities and create dazzling new ways to entertain the passengers. This is how they maintain their reign of providing the highest percentage of satisfied customers among all other vacation experiences. In other words, what is important to Puerto Peñasco is for us to realize that this tourism market segment comes to us as a fun group of super-spoiled visitors who have been blinded with kindness, detail, attention, opulent surroundings, myriad fun activities and anything less they encounter before or after their cruise is a glaring distraction. On the other hand, by recognizing with whom we’re dealing, we can prepare ourselves to provide the same high standards of service and infrastructure amenities so that we are perceived as a seamless extension of the quality they have become used to while cruising. In addition, we have the golden beaches, spacious luxury accommodations and our own brand of entertainment and activities to entice them to stay a few days longer before and/or after their cruise. We will delve into the all-important subject of infrastructure in upcoming articles, which you will find much more complex for cruisers than we are used to. The good news is the special infrastructure required for the cruise market is comparatively easy to put in place with proper planning. As we breakdown cruise passenger expenditures, keep in mind the difference in value of a tourist dollar to the community vs. the exchange of money for goods and services by local residents. Look at a tourist dollar as one that is “dropped off” into our economy by someone who then leaves. The dollar stays here and is spent by the merchant who received it to pay a local employee, or to buy lunch from another local vendor, or to pay utilities, or buy some tires or gas for his vehicle. That money circulates around and around the community, from 7 to 15 times, called the “multiplier effect”, adding value to the economy each time it is “recycled” within the community. The multiplier is made possible because the original owner of that dollar—the tourist—is not around to reclaim it through some natural process and take it away from the community, called “leakage”. By the way, this formula applies to all tourist dollars expended everywhere in the world. As a homeport, we get the first chance to make a good first impression on every cruiser (and his money) before he boards the ship. In fact, since the average cruise party is 2.1 passengers and they must return to us after they cruise, we get the opportunity to “double dip”, actually, what we get is another opportunity to impress them with all the reasons to take their next land vacation right here in our little slice of paradise by the sea. In the meantime, we know that on average, 40% of the passengers on every cruise ship departing our port will arrive 1.5 days early and spend an average of $155.62 on lodging, food and beverages, ground transportation, shore excursions, clothing, Mexican Moon Shine Tequila and Tequila Peñasco, crafts and souvenirs from Mermaid’s Market, Cholla Mall or the Malecón, entertainment, beach activities, jewelry and watches, perfumes and cosmetics and electronics. If they have a pleasant experience before the cruise, there’s a good chance they may stay a couple of days longer when they come back. 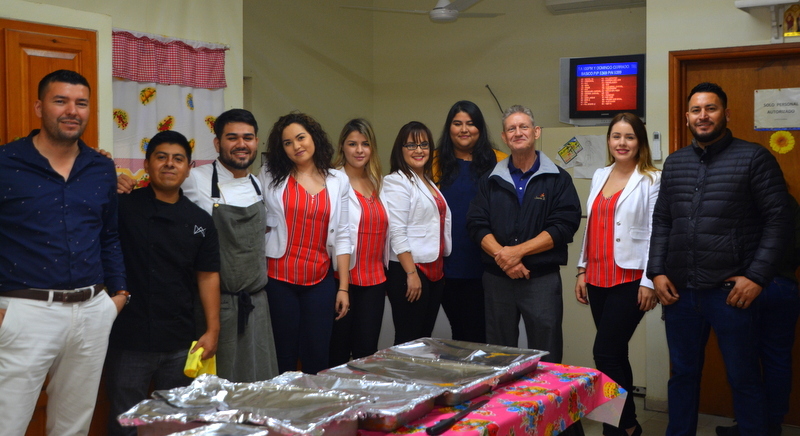 In Part III of our ongoing series about the economic impact of the homeport on Puerto Peñasco, we’ll explore further into the mindset of this fascinating market segment and the critical importance of having all our infrastructure “ducks in a row” by the time our first “spoiled” cruiser rides into town; and maybe a dash of discussion on potential cruising itineraries in the Sea of Cortez. Plus, as in each of the articles in this series, we’ll have updates on the status of construction going on “Down by the Pier”. DOWN BY THE PIER In Part I last month we promised to get the facts straight from exclusive interviews with behind-the-scenes leaders of the homeport construction project. 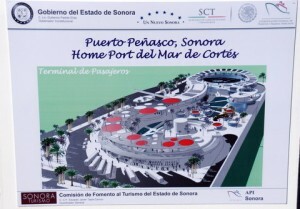 We met with Mrs. Wendy Winzer, Administrative Director for the Homeport project under the general contracting company, Consorcio Constructor de Obras Marinas SA de CV (CCOM) who were appointed by the state of Sonora to oversee the construction phases of the project because of their worldwide experience in marina construction. CCOM brought in two sub contractors with marina experience and contracted with the local union to operate the 90 trucks you see hauling rocks, stone and boulders to build the breakwater. Seems like every time we look, the breakwater has reached further into the sea. That’s because the trucks have been working mostly 12 hour shifts and the water is not so deep where they’ve been pouring the rocks up to now. This has allowed them to build 440 meters of the 1,280 meter breakwater since beginning the project just a little over 40 days ago. “Of course,” says Wendy, “progress won’t seem quite so obvious now that we are reaching deeper waters, even though we are considering extending the shifts to compensate for the additional loads that will be required.” If you’ve noticed the truck movement has slowed down recently, it’s because they are waiting on the permits allowing them to dynamite more of the mountain from which the stone is being transported. The breakwater is built up from the bottom of the sea using three different sizes of rock according to a design that will result in a solid 10 meter wide road surface flanked on the outside by boulder-sized stone all the way to the sea floor. These boulders will serve as protective living areas for the smaller organisms and plants which have been carefully moved from the construction path almost daily by divers from the full time ecological protection company, Ornitorrinco AC (OAC) which means Platypus in English. OAC is the company that conducted the preliminary eco-studies to determine the feasibility of the homeport in the beginning. Their familiarity with the specific area is very important to the environmental concerns of everyone involved with the homeport’s realization. In fact, OAC have up to five divers who inspect the sea floor and pathway of the jetty as it is being built, relocating even the smallest life forms to safe areas then returning them when it’s safe to do so. There are no reefs in the pathway of the jetty to be concerned about, although there is some small coral growth around the 750 meter point which have been relocated to safety. To be absolutely clear, according to both companies, there has been no destruction, or even damage, nor will there be to any ecologically related life forms, flora or reefs at any time during the entire construction process of the homeport. Another area of concern on our part was based on comments overheard around town regarding the homeport construction having minimum impact on the local economy because everyone on the project was brought in from out of town. 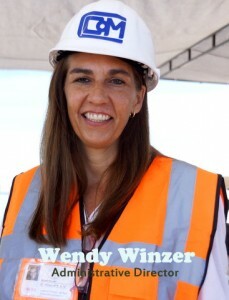 Graciously, Wendy referred to her personnel files and, of the nearly 200 people currently on the project, she counted a total of 21 from outside Puerto Peñasco. She did state that the truck and heavy equipment operators are contracted by the local union and not under the control of CCOM. Next month in the Down by the Pier section of this series, we’ll go into more detail about the port facilities and services surrounding the physical homeport structure, plus updates on the port construction progress. And, as always, we’ll replace the “word on the street” with the “facts from the port”. To close for this month, we’ll address a question that should be at the top of everyone’s mind: When will the homeport construction be completed? Because the construction process is divided into several phases with parts of each being put out for bids, the answer to this question will also have to come in phases. 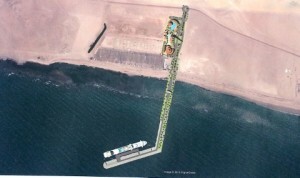 Phase I of the contractual agreement between the general contractor and the State of Sonora includes the breakwater (aka jetty or pier) and docking berth (parking space for one cruise liner). The agreement calls for completion of the main pier and docking berth by December of this year, 2014. The second part of Phase I includes a second docking berth and the ultra-modern Terminal with the completion date yet to be determined since bids have not gone out for them as yet—still an aggressive goal, for sure; and one that if anyone can meet, it will be CCOM and their lively, energetic, seemingly everywhere at once, Homeport Administrative Director, Wendy Winzer! 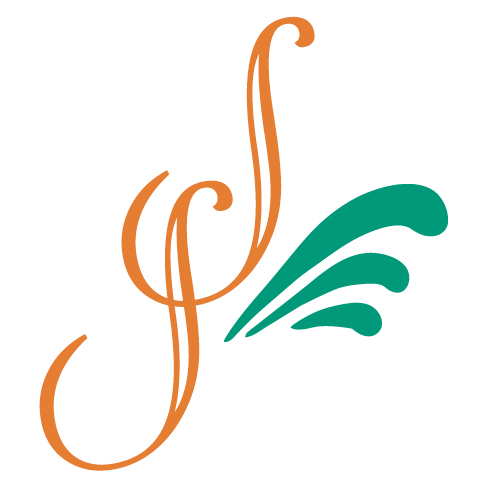 This blog is powered by www.sonoranresorts.mx, Jim Ringquist, Director of Sales and Marketing.